The original design of the P.T.T. 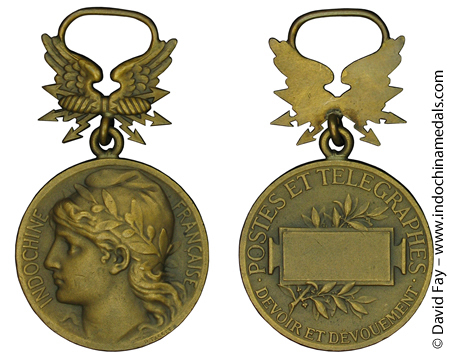 medal of the Metropole was decreed March 22, 1882, and was executed by P. Tasset following an earlier design by J. Robert. 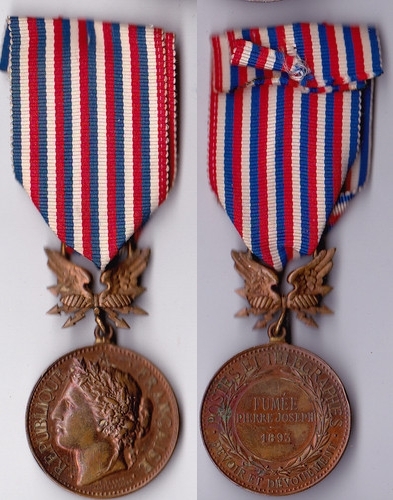 It was awarded also to personnel of the Indochina P.T.T., in Tonkin first in 1885 and in Cochinchina in 1889. 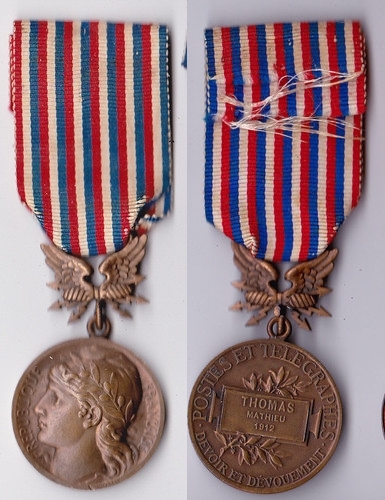 The first version had ribbon of seven sets of red, white, and blue stripes. 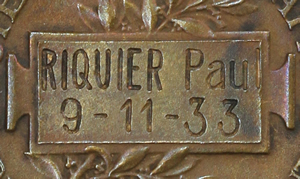 This was replaced by the second design of Tasset in 1902. 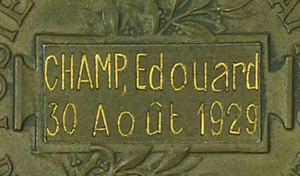 Reportedly, there were also minor varieties, the first having the name of the awardee in the cartouche in relief, the second of 1924 having the name cut into the cartouche, and the third of 1926 having a uniface suspension piece. There was also a gold or gilt class decreed December 1, 1913. 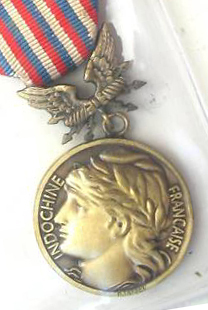 The medal of Indochina was established in 1928, differing from the model of the Metropole only in the inscription “INDOCHINE FRANÇAISE” rather than “REPUBLIC FRANÇAISE”. 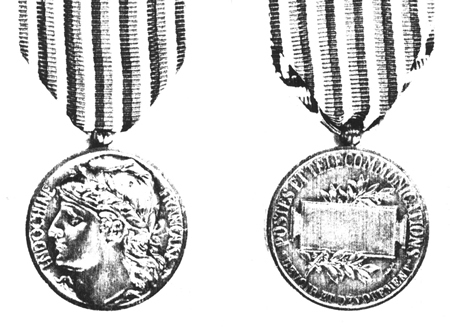 It was also awarded in versions for many other French colonies with the appropriate differing inscriptions. 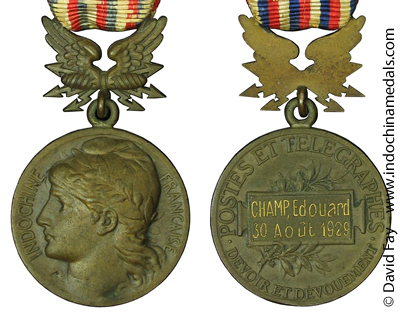 For the Indochina award, 30 medals in bronze were allocated yearly for Europeans and 70 for natives, and in silver 20 and 30 respectively. 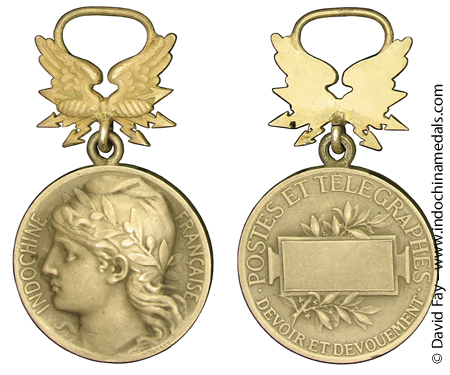 The monetary allowance grew from an original 100 Francs to 1000 Francs for the bronze and 2000 Francs for the silver in 1955. 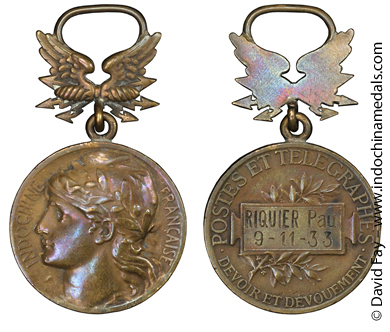 11/A/2 Second Class - Bronze - possible copy ?